Shockproof material, abrasion resistant, extrusion resistant to protect your camera better. Hand carrying or shoulder strap. A pocket on the side of the bag, you can put the bag, you can put the battery, memory card, charger and other accessories. New style design for DC/DSLR camera, unique and stylish! To protect your camera against damage, dust and scratches with its tough and durable foam, exterior and its padded anti-shock interior. Dimensions: Approx. 21 x 16.5 x 12cm/ 8.27x 6.5 x 4.7"
Upper Inner Size: Approx. 11 x 15cm/ 4.3 x6"
Below Inner Size: Approx. 8 x 11cm/ 3 x4.3"
Height Inner Size: Approx. 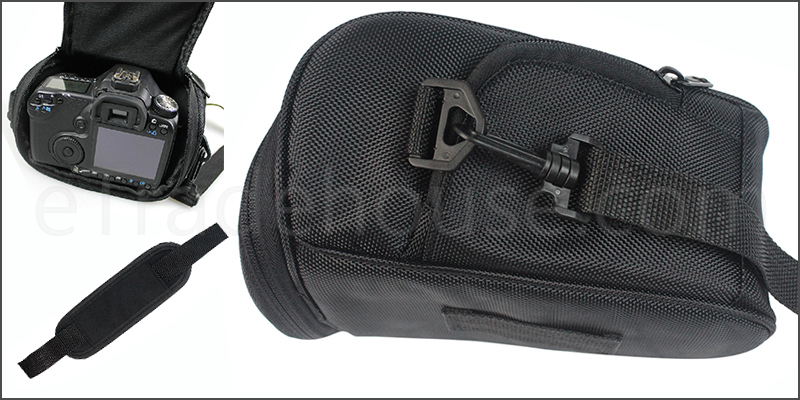 20cm/ 7.87"
1x Camera Case Bag For Canon EOS.